The Grand Cherokee Trackhawk is said to be the most powerful and fastest Jeep SUV ever, which will be introduced in Europe in the coming months. Major car-makers across the globe are getting ready for the Geneva Motor Show, and not far behind is the American SUV-maker Jeep. 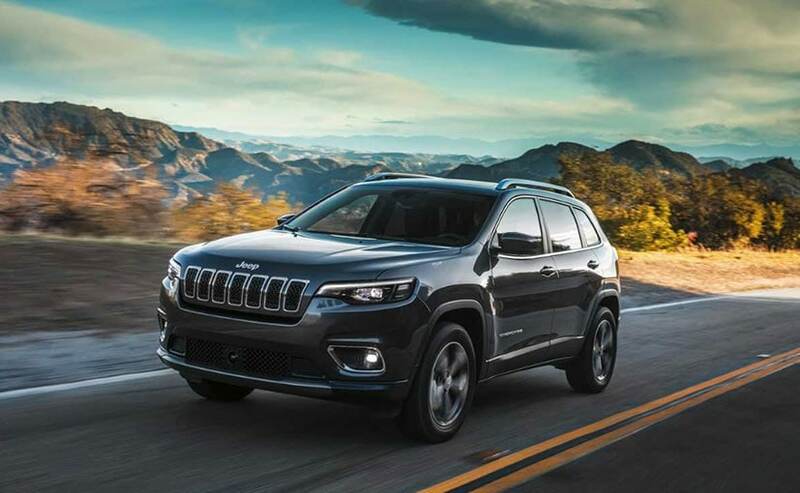 The Fiat Chrysler Automobiles (FCA) owned Jeep brand will have three major debuts at the upcoming Geneva Motor Show 2018, which includes the all-new Wrangler and 2019 Jeep Cherokee. This also marks the world premiere of the new Jeep Grand Cherokee Trackhawk which is on display for the first time at a motor show in Europe. The Grand Cherokee Trackhawk is said to be the most powerful and fastest Jeep SUV ever, which will be introduced in Europe in the coming months. Will the Grand Cherokee Trackhawk come to India? Well, we have our doubts, but do expect the new Wrangler and the 2019 Jeep Cherokee to make it to our shores sometime next year. Jeep took the curtains off the new Wrangler last year at the LA Auto Show, and we were mighty impressed with the new updates to its overall look along with the new engine options. 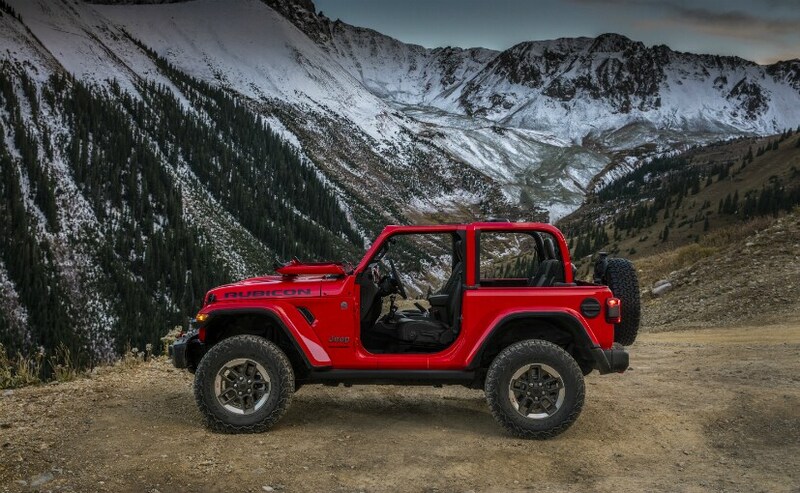 In terms of design, not much has changed from the previous generation Wrangler, however, the 2019 Wrangler gets bigger front bumper, new air vents on the front fenders, new door handles and the windshield is now foldable. Subtle changes to the exterior gives the 2019 Jeep Wrangler a more premium feel to it. On the inside, the new Wrangler gets an option between a 7-inch or an 8-inch infotainment system, which comes smartphone integrated with FCA's (Fiat Chrysler Auto) UConnect interface. This interface will help with information on oil-pressure, temperature, altitude, latitude and longitude. Engine options include a 3.6-litre V6, a 2.0-litre engine and a 3.0-litre turbocharged diesel. Transmission duties will be carried out by either the old 6-Speed manual transmission or by the new 8-Speed automatic transmission. Moving on, the 2019 Jeep Cherokee facelift was unveiled at the Detroit Motor Show earlier this year. A revised design, new styling and a host of new features, the 2019 Jeep Cherokee facelift also gets a new engine option, and will go on sale in the US soon. Visually, the 2019 Jeep Cherokee facelift has undergone heavy changes to the exterior. The front grille gets a revised signature 7-slot grille with chrome borders, horizontal Bi-LED projector headlamps with integrated LED DRLs, round LED foglamps and a mean looking black bumper. It also gets electrically operable ORVMs, new tailgate, a roof-mounted spoiler and new rear bumper with dual chrome-tipped exhaust. Engine option includes- a new turbocharged 2-litre direct-injection engine, a 3.2-litre Pentastar V6 and a 2.4-litre PZEV Multiair2 Tigershark four-cylinder engine. All the engines come mated to a high-efficient 9-Speed automatic transmission. Now, making its world debut is the all new Jeep Grand Cherokee Trackhawk, which claims to be the fastest Jeep SUV ever made. With a 6.2-litre supercharged Hellcat V8 engine under the hood, Jeep Grand Cherokee Trackhawk can punch out power of 707 bhp and a mammoth torque of 868 Nm combined with the upgraded 8-speed automatic transmission. With this engine, the Trackhawk can do 0 - 100kmph in just 3.7 seconds and has a top speed of 289kmph. This also makes the new Trackhawk one of the quickest SUV out there in the market as it takes on the like of Bentley Bentayga. 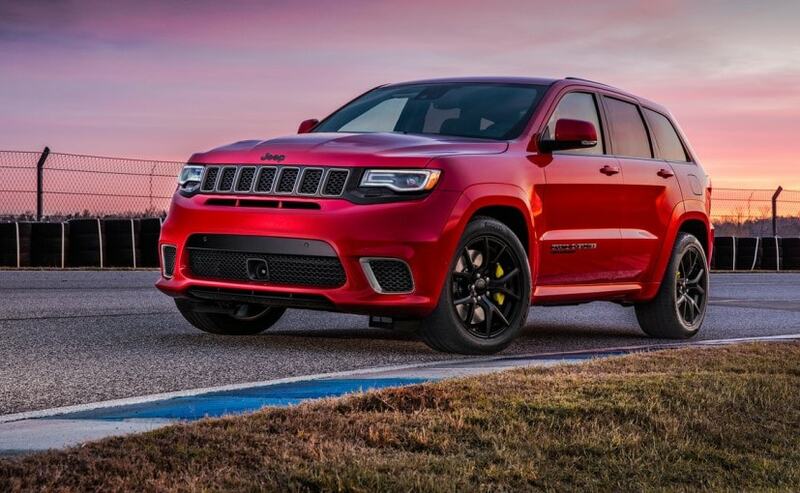 In terms of styling, the 2019 Jeep Grand Cherokee Trackhawk gets an aggressive design with its body-colored wheel flares, a sculpted hood with dual heat extractors and quad exhaust tips. The signature seven-slot upper front grille is flanked by adaptive, bi-xenon headlamps that are surrounded by an LED character lamp treatment. The headlamps on the Trackhawk model feature a unique gloss black background to accent its jewel-like appearance. This is complimented by the new 20" x 10" titanium finish wheels, revealing distinctive yellow Brembo brake calipers, a 'Supercharged' badge on both front doors and a 'Trackhawk' badge on the lift-gate. The interior draws inspiration from racing world and this is evident with exclusive light black chrome finishes and carbon fibre inserts. The dashboard features a 7-inch driver information display (DID) instrument cluster, which features the tachometer in the middle, while the speedometer is on the left side of the cluster. It also gets the new 8.4-inch UConnect display that features Apple CarPlay and Android Auto, as well as Trackhawk-exclusive Performance Pages that showcase immediate feedback on the car's performance. Along with these models, Jeep will also showcase the 2018 Jeep Renegade, Jeep Compass Night Eagle Edition and Jeep Grand Cherokee S versions. Moreover, the new five-door Jeep Wrangler Sahara will also debut at the Geneva Motor Show, and it featuring a steel blue-metallic exterior and a special customization created by Mopar to enhance the off-road capabilities of the iconic Jeep.